The leaves and trunks of quaking aspen – Populus tremuloides – via The Wild Garden. The technique of using nature to solve human problems is called biomimicry. Researchers at University of Warwick in Coventry, England, said this week (March 18, 2019) that they used this technique – inspired by the unique movement of the leaves of quaking aspen trees (Populus tremuloides) – to devise an energy-harvesting mechanism that could power weather sensors in hostile environments. They said the mechanism might also serve a backup energy supply that could save and extend the life of future Mars rovers. That’s particularly interesting now, in the wake of the loss of the Mars rover Opportunity, whose solar power supply succumbed to a big Mars dust storm last summer. If you’ve never been in an aspen forest, you’ve missed something. The leaves of these trees – commonly called Quakies in some parts of the U.S. Southwest – quiver in the slightest breeze. Many people find them restful, and they are certainly uniquely beautiful. 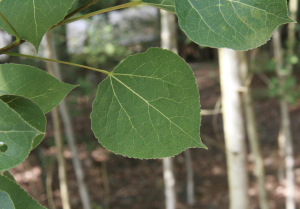 These engineering researchers saw something else in aspen leaves. They found that the underlying mechanisms that produce an aspen leaf’s quiver in low wind could generate electrical power, as they said, “efficiently and effectively.” They designed a device modeled on the leaf that exploits wind-generated movement. Their work is published in Applied Physics Letters, which is reviewed by multiple editors and expert referees.